An earlier post on this blog noted the rising popularity of book clubs and wondered how publishers might better market their titles to this population of book lovers. Time to consult the experts. And the expert on such matters is, without question, Diana Loevy. Diana is the author of “The Book Club Companion: A Comprehensive Guide to the Reading Group Experience,” published by Berkley Books, a division of Penguin Books USA. Her work is the definitive guide to the culture, indispensable titles and best practices of book clubs nationwide. Diana leads an editorial and marketing consulting business. Previously, she conceived, developed and launched the Reading Groups Internet site for Bookspan, the book club division of Bertelsmann and Time Warner. 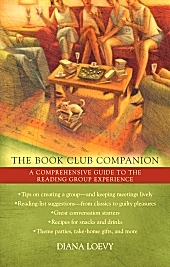 As editor for The Literary Guild and Black Expressions companion Web sites, Diana created the first of its kind readers’ guide incorporating unique book-related and home entertainment content for club members. She served as Vice President, Editorial Director of United Media in New York, where she acquired and launched comic strips and features for newspaper syndication, as well as implemented publishing and licensing programs for renowned authors and artists including Dilbert by Scott Adams. Diana lives in Westport, Connecticut with her husband and son. I recently interviewed Diana about the growth and popularity of book clubs, and how authors and publishers can get book clubs interested in their titles. FPP: Can you provide a rough idea of how many book clubs there are in the US and about how many members? Is any data available worldwide? FPP: Is membership in book clubs growing, and if so, what factors do you attribute for this growth? Diana: Membership has doubled in the past decade, according to the estimates, I believe for a number of reasons. Book clubs really work as cohesive social groups. There is as much substance in the book discussion as the members want, and it’s an entertainment event for hosts. Between work and families, it is very hard to find time to entertain in the traditional sense. But if you are hosting once a year – assuming there are 10-12 members of your book club as there are on average, it is workable. I have seen a trend of people joining more than one book club. Each club is different and the reading lists are subtly different. Other factors include the ease of buying books online, combined with the hands-on, hand-sell approach of the bookstores. Libraries have become more proactive and increasingly helpful to clubs and each community has its own book club resource. Combined with Oprah’s continuing book club selections (you cannot underestimate her influence, even if you don’t read every book) and the ubiquity of email, which makes it possible to organize meetings and send messages to members that enhance the social aspects of the club. The publishers also go out of their way to develop discussion questions and web support and make authors available. So the atmosphere is right for book clubs to flourish. FPP: Are book clubs predominantly fiction or non-fiction? Diana: Predominantly fiction, though most clubs will read one or two nonfiction selections a year. There are certain memoirs like The Glass Castle by Jeannette Walls that are considered must reads. FPP: What are the demographics of book clubs in terms of gender, age and ethnicity? more parent-child clubs, teen clubs and clubs of people in their 20s who use them as professional networking clubs and meet in restaurants. Book clubs comprised of African American members are very popular and many of these clubs pioneered author visits to club, club trips to the theater, websites, regional meetings and other innovations. FPP: Have book clubs traditionally been a good venue for publishers and authors to market and sell their books? Do you have an example of this? formats and big production numbers like the film for On Chesil Beach by Ian McEwan. So if the quality is there, the marketing might take hold. And then it snowballs. Clubs like to read books that other clubs are reading. This is reflected in the trade paperback bestseller list and on the book club tables at the bookstores. Early readers such as bookstore people who often lead and organize discussion groups at the store often give early indicators of how a book will be adopted into a club. FPP: What is the best way for a publisher or author to discover which book clubs night be good candidates for their book(s)? Diana: Very tricky. Clubs usually don’t like to be the subject of the hard sell. Publishers and authors have to remember that the club members are interested in each other first, the book second. And they look forward to discussing what to read next. Champions of the book have to make good arguments for the adaptation of a book and this can often become very heated, but that’s part of the whole format and success of the book club. The person pitching the book doesn’t have many chances to pitch the same book. If a person comes back month after month with the same title, it becomes a hilarious in-joke. I would say developing clubs where you have had successes is the best bet for publishers and authors. And it takes time to cultivate clubs. FPP: How should a book club be approached? Is there a good print or online reference list of book clubs and contacts? Diana: There are no short cuts. Clubs are usually very private. However, books stores and libraries act as regional centers for clubs and sometimes they will have events. I would contact as many as you have time for to create a calendar of book club events and book festivals. The Tattered Cover in Denver, for instance, has a famous bookstore event in January. BookSense is really a dominant force in terms of forecasting book club books, capturing the current sales picture and offering programs for publishers/authors that can be quite effective. I would also look for other organizations in the community and start cultivating email lists. FPP: Are live appearances by an author usually effective? If it is not feasible for an author to appear in person, are there some other strategies to get the book club interested? Diana: I know authors who speak to dozens of clubs. It does have some good effect, though each author has to assess the time put in vs. book sale ratio. A mix of public and private appearances, a targeted email list and print/online reviews is best. Every little bit helps. It is expected that authors manage much of their own marketing and outreach to book clubs. And as I said, there are no short cuts. Word of mouth for access to book clubs is still most effective. And organizing your lists. FPP: Is there an advantage to approaching book clubs before the release of a title? Splendid Suns by Khaled Hosseini, for instance. I mean, you can’t read every book, and groups usually have a maximum of 12 per year, and that’s usually less because of holidays or summer when some groups go on vacation. But there are certain types of clubs – perhaps those comprised of librarians, teachers, booksellers and bloggers – who might like the opportunity to preview titles. It might be worth cultivating such groups of early adopters. But it is not the norm. FPP: What trends do you see in the evolution of book clubs? Diana: Every day I see new projects by authors, booksellers, publishers, entrepreneurs, even hotels and restaurants that are hosting groups and book clubs. Book clubs are just a fact of life. If these initiatives succeed, there will be more of them. A lot of authors are using My Space, web sites and other web initiatives. I just returned from Book Group Expo where authors and book club members meet. It was at the San Jose convention center and only its second year. There were well over 1,000 people there and a very successful event. The group will be expanding to more cities. There will be more initiatives from entrepreneurs — Chris Anderson has a new web site for authors called Booktour.com for instance. As you pointed out in your blog about meetup.com, you can start with a virtual tour of those club members. It will be interesting to see how the clubs formed on Meetup and other internet-driven meeting sites fare in the long run. There will be more people wanting to join already existing book groups, waiting lists for some clubs, decimation of others whose members may be in flux (too many members moving, not enough outreach, not enough concentration on the book). In many cases, clubs become too focused on the social, really relegate the book to a minor spot on the schedule and then give it a very cursory discussion. These clubs can be considered at risk. Traditional reviews and the recommendations of booksellers are not going to go away. If anything, these traditional sources will be more important, if not the only, voices whispering in the ears of club members. Authors will take on more and more of the marketing responsibilities of their books. And each will have to assess how effective that marketing is vs. the time and money spent on reaching an audience. More and more book club books are being adopted by high schools, thus ensuring their durability. I think this is a sign of health in the decision making process all along the line, from acquisition at the publishing house to the 9th grader reading The Secret Life of Bees for the first time. While there will be technological and marketing innovations, some clubs will enter their Baroque phase where they will plan more events, go on ever more thematic trips and spend even more time with one another. And the strict clubs will be more rigorous than ever. Meanwhile, the rest of us will continue to choose books – from the bestseller list and from the freshman curriculum we managed to miss the first time around. This entry was posted in Interviews, readership strategies. Bookmark the permalink. I’ve only just found this (brilliant) article, so many years late with this comment, but thanks so much Diana for such great information. I shall certainly be purchasing your book. How interesting to learn that women make up such a high proportion of book groups – I would never have guessed at 80%. Amazing.